Gavrilo Princip, a simple postman’s son, probably didn’t realize at the time that by firing those three fateful shots, he was starting a chain reaction that would lead directly to the start of World War I. In the summer of 1914, the by now 47-year-old Austro-Hungarian Empire stretched from the Austrian Alps in the west to the Russian border in the east and reached far into the Balkans to the south (map). It was the second-largest European nation next to Russia and boasted a multi-ethnic population made up of at least ten different nationalities. These included Austrian Germans, Hungarians, Czechs, Slovaks, Poles, Romanians, Italians, Croats and Bosnians among others. But the empire was far from united. Its various ethnic groups and nationalities were constantly competing for control in a state that was predominantly ruled by the Austrian-German Habsburg family and the Hungarian nationals—both of whom resisted sharing the majority of their power and influence with the rest of the empire’s diverse population. For many of those outside the German-Hungarian ruling class, the empire represented nothing more than an undemocratic, repressive regime occupying their traditional homelands. Nationalistic sentiments and struggles for autonomy often resulted in public riots and clashes with the ruling authorities such as in Vienna in 1905 and in Budapest in 1912. The Austro-Hungarians responded harshly to incidents of unrest, sending in troops to keep the peace and suspending local parliaments. Nevertheless, by 1914 unrest was a constant in almost every part of the realm. By 1914, Emperor Franz Josef—a member of the long-standing royal House of Habsburg—had ruled Austria (called Austria-Hungary from 1867) for nearly 66 years. As a monarch, Franz Josef was a staunch traditionalist and remained so well into the later years of his reign, despite the many great changes that had led to the weakening of monarchical power in other parts of Europe. He resisted all notions of political reform and viewed himself as the last of the old-school European monarchs. Emperor Franz Josef fathered two children. The first, however, died in infancy and the second committed suicide in 1889. By right of succession, the emperor’s nephew, Franz Ferdinand, became next in line to rule Austria-Hungary. The uncle and the nephew often clashed over differences in approach to ruling the vast empire. Franz Ferdinand had little patience for the ostentatious pomp of the ruling Habsburg class. Nor did he agree with his uncle’s harsh stance towards the rights and autonomy of the empire’s various national groups. He felt the old system, which allowed ethnic Germans and ethnic Hungarians to dominate, could not last. Franz Ferdinand believed the best way to regain the population’s loyalty was to make concessions towards the Slavs and other ethnicities by allowing them greater sovereignty and influence over the governance of the empire. He envisioned the eventual emergence of a type of “United States of Greater Austria,” with the empire’s many nationalities sharing equally in its administration. He believed strongly that this was the only way to keep the empire together and to secure his own future as its ruler. The result of these disagreements was that the emperor had little love for his nephew and bristled at the thought of Franz Ferdinand’s future ascension to the throne. 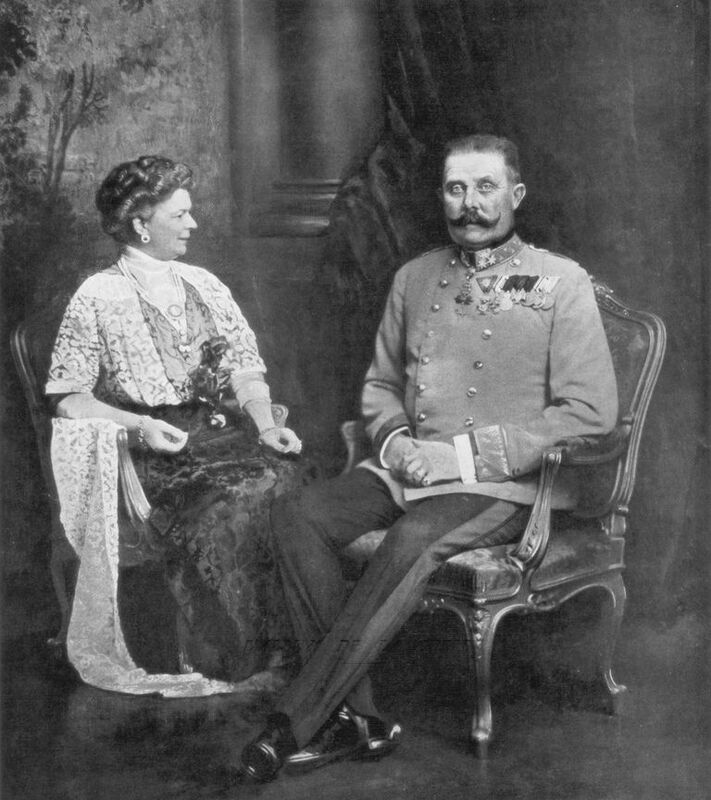 The tension between them grew even stronger when, in 1900, Franz Ferdinand took as his wife the Countess Sophie Chotek. Franz Josef did not consider Sophie to be an appropriate future empress as she was not directly descended from royal, imperial blood. In 1914, Serbia was one of the few independent Slavic states in Europe, having gained its autonomy piecemeal throughout the previous century after hundreds of years of Ottoman rule. The majority of Serbs were staunch nationalists and the kingdom saw itself as the great hope for the sovereignty of Slavic peoples in the Balkans. The great dream of Serbian nationalists was the unification of Slavic peoples into a single sovereign state. The Ottoman, Austro-Hungarian, and Russian empires, however, were perpetually struggling for control and influence over the Balkans and Serbs felt under constant threat from their powerful neighbors. Austria-Hungary, in particular, posed a threat due to its close proximity to Serbia’s northern border. The situation was exasperated by the fact that pro-Austrian monarchs—with close ties to the Habsburgs—had ruled Serbia since the late 19th century. The last of these monarchs, King Alexander I, was deposed and executed in 1903 by a clandestine society comprised of nationalistic Serbian army officers known as the Black Hand. It was this same group that would come to help plan and support the assassination of Archduke Franz Ferdinand eleven years later. The aim of the Black Hand was the unification of all southern Slavic peoples into the single Slavic nation-state of Yugoslavia—with Serbia as its leading member—and to protect those Slavs and Serbs still living under Austro-Hungarian rule by any means necessary. The group relished in the ethnic and nationalistic strife that had overtaken Austria-Hungary and sought to stoke the flames of its decline. Anything that was potentially bad for its powerful northern neighbor was seen as potentially good for Serbia. The high-ranking, Serbian, military positions of its founding members put the group in a unique position to carry out clandestine operations deep within Austria-Hungary itself. This included army colonel Dragutin Dimitrijević, who would later become the head of Serbian military intelligence and leader of the Black Hand. The Black Hand frequently sent spies into Austria-Hungary to commit acts of sabotage or to foment discontent amongst Slavic peoples inside the empire. Their various anti-Austrian propaganda campaigns were designed, especially, to attract and recruit angry and restless Slavic youths with strong nationalistic sentiments. One of these youths—a Bosnian, and a member of the Black Hand-backed youth movement known as Young Bosnia—would personally carry out the murders of Franz Ferdinand and his wife, Sophie, and thus help to unleash the biggest crisis ever to face Europe and the world to that point. Gavrilo Princip was born and raised in the countryside of Bosnia-Herzegovina, which had been annexed by Austria-Hungary in 1908 as a means to preempt Ottoman expansion into the region and to thwart Serbia’s aims for a greater Yugoslavia. Like many of the Slavic peoples living under Austro-Hungarian rule, Bosnians dreamed of the day when they would gain their independence and join a larger Slavic union alongside Serbia. Princip, a young nationalist, left for Serbia in 1912 to continue the studies he had undertaken in Sarajevo, the capital of Bosnia-Herzegovina. While there, he fell in with a group of fellow nationalist Bosnian youths calling themselves Young Bosnia. The young men in Young Bosnia would sit long hours together and discuss their ideas for bringing about change for Balkan Slavs. They agreed that violent, terroristic methods would help to bring about a speedy demise of the Habsburg rulers and ensure the eventual sovereignty of their native homeland. When, in the spring of 1914, they learned of Archduke Franz Ferdinand’s visit to Sarajevo that June, they decided he would be a perfect target for assassination. But they would need the help of a highly organized group like the Black Hand to pull off their plan. The Young Bosnians’ plan to do away with the Archduke eventually reached the ears of Black Hand leader Dragutin Dimitrijević, the architect of the 1903 overthrow of Serbia’s king and by now chief of Serbian military intelligence. Dimitrijević had been made aware of Princip and his friends by a subordinate officer and fellow Black Hand member who had complained of being pestered by a group of Bosnian youths bent on killing Franz Ferdinand. By all accounts, Dimitrijević very casually agreed to help the young men; although secretly, he may have received Princip and his friends as a blessing. The official reason given for the Archduke’s visit was to observe Austro-Hungarian military exercises outside the city, as the emperor had appointed him inspector general of the armed forces the previous year. Dimitrijević, however, felt sure the visit was nothing more than a smokescreen for a coming Austro-Hungarian invasion of Serbia, though no evidence exists to suggest such an invasion was ever planned. Furthermore, Dimitrijević saw a golden opportunity to do away with a future ruler who could seriously undermine Slavic nationalistic interests, were he ever to be allowed to ascend to the throne. The Serbian nationalists knew well of Franz Ferdinand’s ideas for political reform and feared that any concessions made by Austria-Hungary towards the empire’s Slavic population could potentially undermine Serbian attempts at fomenting discontent and inciting Slavic nationalists to rise up against their Habsburg rulers. A plan was devised to send Princip, along with Young Bosnian members Nedjelko Čabrinović and Trifko Grabež, to Sarajevo, where they were to meet up with six other conspirators and carry out the assassination of the Archduke. Dimitrijević, fearing the assassins’ inevitable capture and questioning, instructed the men to swallow cyanide capsules and commit suicide immediately after the attack. No one was to be allowed to learn who had authorized the murders. Initially, Franz Ferdinand never intended to visit Sarajevo itself; he was to keep himself outside the city for the task of observing military exercises. To this day it is unclear why he chose to visit the city, which was a hotbed of Bosnian nationalism and thus a very hostile environment for any visiting Habsburg. One account suggests that Bosnia’s governor-general, Oskar Potiorek—who may have been seeking a political boost at Franz Ferdinand’s expense—urged the Archduke to pay the city an official, all day visit. Many in the Archduke’s entourage, however, protested out of fear for the Archduke’s safety. What Bardolff and the rest of the Archduke’s entourage did not know was that June 28 was a Serb national holiday—a day that represented Serbia’s historical struggle against foreign invaders. After much debate and negotiation, the Archduke finally bent to Potiorek’s wishes and agreed to visit the city on June 28, 1914, but only in an unofficial capacity and for only a few hours in the morning. Gavrilo Princip and his co-conspirators arrived in Bosnia sometime in early June. They had been ushered across the border from Serbia by a network of Black Hand operatives, who provided them with faked documents stating the three men were customs officials and thus entitled to free passage. Once inside Bosnia, they met up with six other conspirators and made their way toward Sarajevo, arriving in the city sometime around June 25. There they stayed in various hostels and even lodged with family to await Archduke’s visit three days later. Franz Ferdinand and his wife, Sophie, arrived in Sarajevo sometime before ten in the morning of June 28. After a short welcoming ceremony at the train station, the couple was ushered into a 1910 Gräf & Stift touring car and, along with a small procession of other cars carrying members of their entourage, made their way to the Town Hall for an official reception. It was a sunny day and the car’s canvas top had been taken down to allow for the crowds to better see the visitors. A map of the Archduke’s route had been published in the newspapers prior to his visit, so spectators would know where to stand in order to catch a glimpse of the couple as they rode by. The procession was to move down the Appel Quay along the northern bank of the Miljacka River. Princip and his six co-conspirators had also obtained the route from the newspapers. That morning, after receiving their weapons and their instructions from a local Black Hand operative, they split up and positioned themselves at strategic points along the riverbank. Muhamed Mehmedbašić and Nedeljko Čabrinović mingled with the crowds and positioned themselves near the Cumurja Bridge where they would be the first of the conspirators to see the procession going by. Vaso Čubrilović and Cvjetko Popović positioned themselves further up the Appel Quay. Gavrilo Princip and Trifko Grabež stood near the Lateiner Bridge toward the center of the route while Danilo Ilić moved about trying to find a good position. Mehmedbašić would be the first to see the car appear; however, as it approached, he froze with fear and was unable to take action. Čabrinović, on the other hand, acted without hesitation. He pulled a bomb from his pocket, struck the detonator against a lamp post, and tossed it at the Archduke’s car. The car’s driver, Leopold Loyka, noticed the object flying towards them and hit the accelerator. The bomb landed behind the car where it exploded, causing debris to fly and nearby shop windows to shatter. About 20 onlookers were injured. The Archduke and his wife were safe, however, save for a small scratch on Sophie’s neck caused by flying debris from the explosion. Immediately after throwing the bomb, Čabrinović swallowed his vial of cyanide and jumped over a railing down into the riverbed. The cyanide, however, failed to work and Čabrinović was caught by a group of policemen and dragged away. The Appel Quay had erupted into chaos by now and the Archduke had ordered the driver to stop so that the injured parties could be attended to. Once satisfied that nobody was seriously injured, he ordered the procession to continue to the Town Hall. The other conspirators along the route had by now received news of Čabrinović’s failed attempt and most of them, probably out of fear, decided to leave the scene. Princip and Grabež, however, remained. The procession continued on to the Town Hall, where Sarajevo’s mayor launched into his welcoming speech as if nothing had happened. The Archduke immediately interrupted and admonished him, outraged at the bombing attempt that had put him and his wife in such danger and questioned the apparent lapse in security. The Archduke’s wife, Sophie, gently urged her husband to calm down. The mayor was allowed to continue his speech in what was later described by witnesses as a bizarre and otherworldly spectacle. Despite reassurances from Potiorek that the danger had passed, the Archduke insisted on abandoning the day’s remaining schedule; he wanted to visit the hospital to check on the wounded. Some discussion on the safest way to proceed to the hospital ensued and it was decided that quickest way would be to go by the same route. Franz Ferdinand’s car sped down the Appel Quay, where the crowds had thinned out by now. The driver, Leopold Loyka, seemed to have been unaware of the change of plans. He turned left at the Lateiner Bridge toward Franz Josef Strasse as if to proceed to the National Museum, which the Archduke had planned to visit next prior to the assassination attempt. The car drove past a delicatessen where Gavrilo Princip had bought a sandwich. He had resigned himself to the fact that the plot was a failure and that the Archduke’s return route would have been altered by now. Somebody yelled out to the driver that he had made a mistake and should have kept going along the Appel Quay to the hospital. Loyka stopped the vehicle and attempted to reverse as Princip emerged from the delicatessen and noticed, to his great surprise, the Archduke and his wife only a few feet from him. He pulled out his pistol and fired. Witnesses would later say they heard three shots. Princip was immediately seized and beaten by bystanders and the gun wrested from his hand. He managed to swallow his cyanide before being tackled to the ground but it, too, failed to work. Harrach then noticed that blood was trickling from the Archduke’s mouth and ordered the driver to drive to the Hotel Konak—where the royal couple was supposed to stay during their visit—as quickly as possible. The Archduke was still alive but barely audible as he continually muttered, “It is nothing.” Sophie had completely lost consciousness. The Archduke, too, eventually fell silent. Upon arriving at the Konak, the Archduke and his wife were carried up to their suite and attended to by regimental surgeon Eduard Bayer. Sophie had been laid out on a bed in the next room. Everyone still assumed she had simply fainted but when her mistress removed her clothes she discovered blood and a bullet wound in her lower right abdomen. She had already been dead by the time they had reached the Konak. The assassination sent shockwaves throughout Europe. Austro-Hungarian officials discovered the Serbian roots of the plot and declared war on Serbia on July 28, 1914 -- exactly one month after the assassination. Fearing reprisals from Russia, which had been a strong ally of Serbia, Austria-Hungary now sought to activate its alliance with Germany in an attempt to scare the Russians out of taking action. Germany, in turn, sent Russia an ultimatum to stop mobilizing, which Russia ignored. The two powers—Russia and Germany—declared war on each other on August 1, 1914. Britain and France would soon enter the conflict on the side of Russia. Old alliances, which had been dormant since the 19th century, had suddenly created a dangerous situation across the continent. The war that ensued, World War I, would last four years and claim the lives of millions. Gavrilo Princip never lived to see the end of the conflict he helped to unleash. After a lengthy trial, he was sentenced to 20 years in prison (he avoided the death penalty due to his young age). While in prison, he contracted tuberculosis and died there on April 28, 1918. Greg King and Sue Woolmans, The Assassination of the Archduke (New York: St. Martin’s Press, 2013), 207.